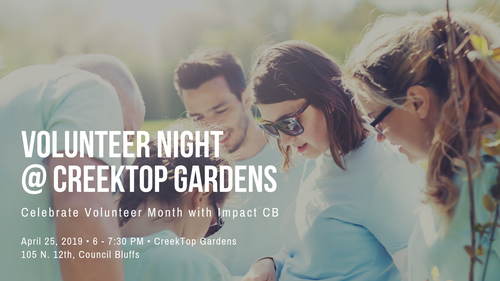 Join Impact CB Young Professionals and other volunteers to celebrate Volunteer Month and help clean up CreekTop Gardens for the next gardening season! Dress casual and bring gardening tools (rakes, shovels) if you have them. We will have free beer while supplies last (feel free to BYOB as well). We also plan to get out the grill and cook up some hamburgers. This event is FREE and open to the public.